I know… I know… I’m here to make amends. 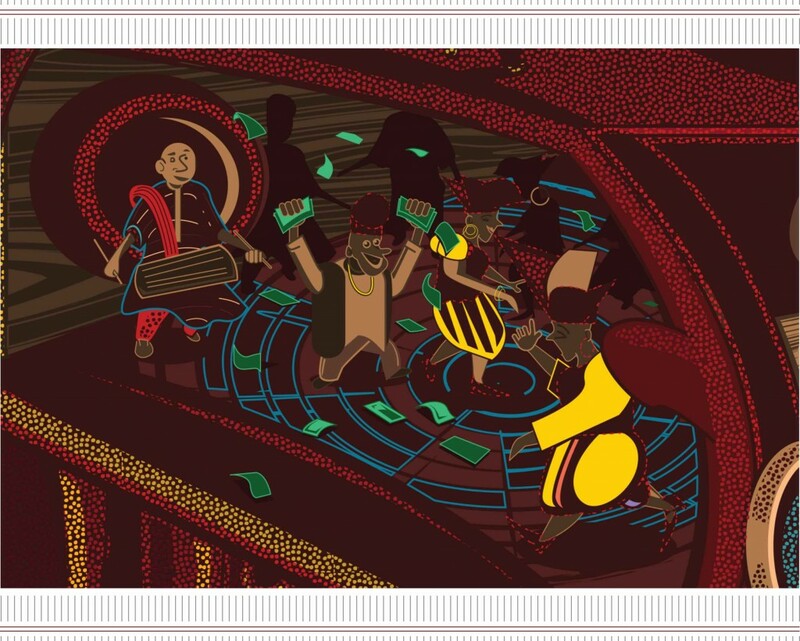 @88factor is a fellow illustrator and sometime last year, a beautiful piece he did called Viva Las Gidi inspired a series of tales I wrote for Art Stories on TNC. The illustration was a collage of sorts and so each story was inspired by a different section. Alhaji Ajagajigi throws the best parties in town. No one can ever rival an Ajagajigi owambe. If you ever catch wind that an Ajagajigi groove is going down near you on a certain day, you must do one of two things: one, move very, very far away the day before the party and do not return until at least twenty four hours after you have heard the party has finally come to an end. Two, if you will not run away, you must surrender entirely to the Ajagajigi groove machine. Cancel all appointments, turn away all visitors, exit your abode and yield yourself totally to the gyration that is about to go down! Shortly after we moved into this area, my baby sister was born. As is customary in Yoruba land, she was to be named in a celebratory manner in the presence of family, friends and well-wishers eight days after her birth. On mama’s arrival from the hospital with our new bundle of joy, the neighbours came to wish us well, sneak a peek at the new baby and… inform my father that he may (would) have to shift his baby’s naming a day forward or two days back. Didn’t really matter which, papa could just not hold his daughter’s naming ceremony on the day his customs said it was to be held. I remember Baba Lasisi licking the tips of seven of his gnarled fingers counting the days to the day Ajagajigi had announced he would be celebrating his latest marriage, to his wife number seventeen. Looking upon Baba Lasisi’s heavily scarified face, one could see the relish with which he licked each finger tip, like he could actually taste the shaki and brokoto and pomo and cow leg and orishirishi and turkey and lots and lots of beer that he would undoubtedly be having that day. He and the whole neighborhood had been invited, as they, we now, had been since Alhaji took wife number six and the neighbours seemed rather convinced that we could not possibly hold our own modest celebration a whole three streets away from the Ajagajigi’s. Papa was and still is a traditionalist and would have none of it, he would name his daughter on the day he was supposed to. He was not convinced. We have long since been convinced. That fateful day, the realization of what an Ajagajigi party entailed began to dawn on us from early in the morning when we would awaken to what appeared to be a great exodus occurring outside our gate. The sound of rustling clothes and slippered feet accompanied by excited chatter and anticipatory chuckles making their way up to the Ajagajigi household would soon mingle with the talking… no, sorry, shouting drums. The shouting drums, ranging from the konkolo omele to the mighty Dùndúnwould be present all of that day… and all of that night. Tents would magically appear, coloured plastic chairs under the tents would follow, with iron tables of course, then the guests would fill the chairs, then their stomachs, and as the skies darken, the chairs would be pushed aside and the tables folded up to make room for the many green and brown and a myriad other colours of bottles that would then make their appearance, ushering in the gyration that is bound to come along when such bottles appear. The noises would begin to subside around four or five a.m. the day after. That year, my small sister was not named until three days past the day she was supposed to be named. You see, an interesting occurrence was discovered. Because we had only recently moved into the area, many of our few guests had not previously been to our house and so, on reaching our neighbourhood and discovering a party going on, assumed it was ours and just settled in. The few who made it a duty to find the celebrants to greet them specially and make their presence known, would wander through many streets in search of us or our house until they would either tire and just settle into the party too or turn back to whence they came in frustration. When daylight returned, our guests would be found strewn in the streets all around alongside the staggering drunks and Ajagajigi guests who had ensured they were nicely entangled in the much refuse that it would take the entire day to clean up. These guests had to be cleaned and rested before they could join in any new celebrations. The ones who had returned home, after being placated over our old Nitel phones, would be given a new date and clearer, more precise directions to the house. We were convinced, oh we were… No party like an Ajagajigi party. In the following years, we would time our celebrations, much like others in the area, to coincide with the Ajagajigi parties. This was found to be a rather economical way of celebrating… co-celebrating sef, our own ordinary little celebrations and turning them into a bigger thing than we could ordinarily afford. The only challenge which would then exist would be our guests locating each other… but what does it matter? The most important thing was that there were celebrants, there was a celebration and there were friends to celebrate with. One could celebrate, drink and gyrate with friends they were just meeting, could they not? Me and mummy have been planning Yimika, my younger sister’s eighteenth birthday party. We hear Alhaji is about to take wife number twenty-two and that the celebrations will be occurring two weekends from now. Yimika turns eighteen next week thursday. Perfect timing.